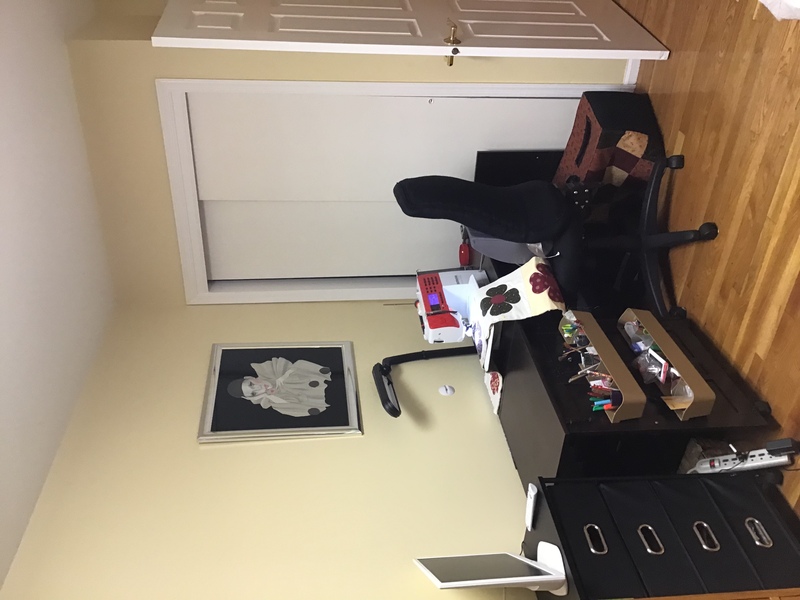 Your Sewing Area - how does it all fit? Thread: Your Sewing Area - how does it all fit? Good idea tranum - getting up and moving around. I try to move between my ironing board and my sewing area. But, I've started walking daily (except on weekends, I might skip it). I still find myself a little stiff in the neck area. So, I guess I'd better start stretching occasionally (especially turning my head to the left and then to the right). 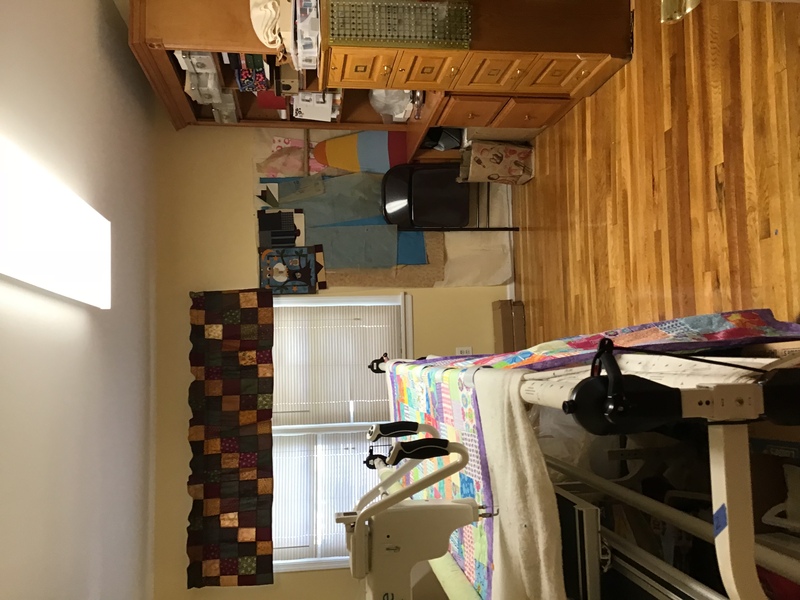 I'm still so enchanted with everyone's pictures of their sewing areas. Gives me inspiration to "keep it tidy" or at least tidy once I'm finished with one project. My second-most used item in my sewing room is the vacuum. I've actually taken it for my own use and only unplug it when it's time for the weekly vacuum of the house. But, everytime I'm done sewing for the day, I turn that puppy on and vacuum up the little strings. Makes me feel like I'm at least keeping something cleaned up! ha! Ha, great habit, Nora. An adult daughter of a friend of mine told about doing her daily yoga in my friend's sewing space when she came to visit. She said that she couldn't believe what her clothes looked like after -full of random strings and bits of fabric. Everyone chuckled and the story was told in a loving, not mean, way. I have my sewing machine on a Walmart craft table. My husband put a piano hinged piece of plexiglass in the back that I used for quilting. I’ve since upgraded to a frame so I don’t use it anymore. I cut on a kitchen base cabinet with stone that someone threw out when renovating, as well as a desk with book shelves where I keep my embroidery machine and serger and a file cabinet where I keep (file) my fabrics. I also have two three tier carts one with draws for my layer cakes, charms and jelly rolls and one for my frame accessories. I wish I had more space but it works for me. Like the other ladies said, it has to work for you. 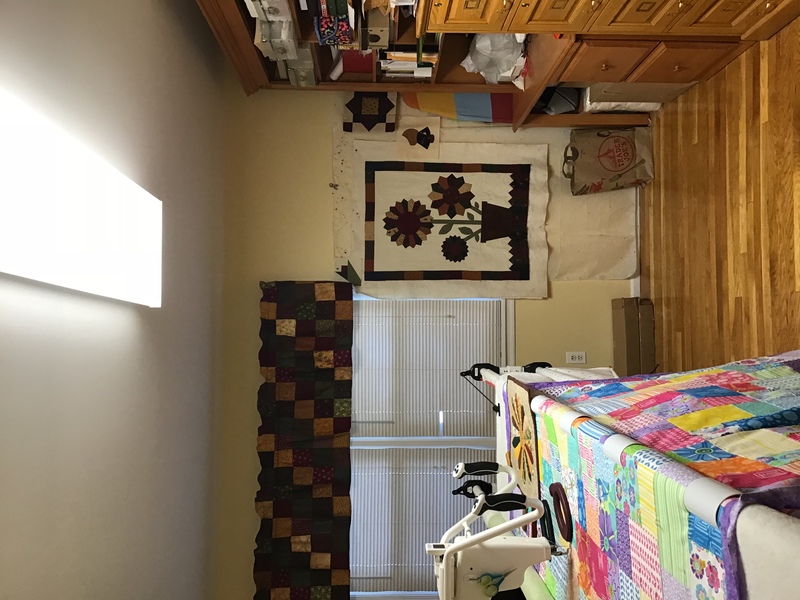 Here are a few pictures of my sewing room. Not a large space but enough space for me to piece, quilt and move around in. I tried to upload pictures of my filed fabrics but kept getting an error message. This is what I call both my haven and heaven lol. Love those pictures! Some day, I'll figure out how to post them. I always have my ironing station out and a cutting table .....so I think that's were I'm getting a bit cramped. 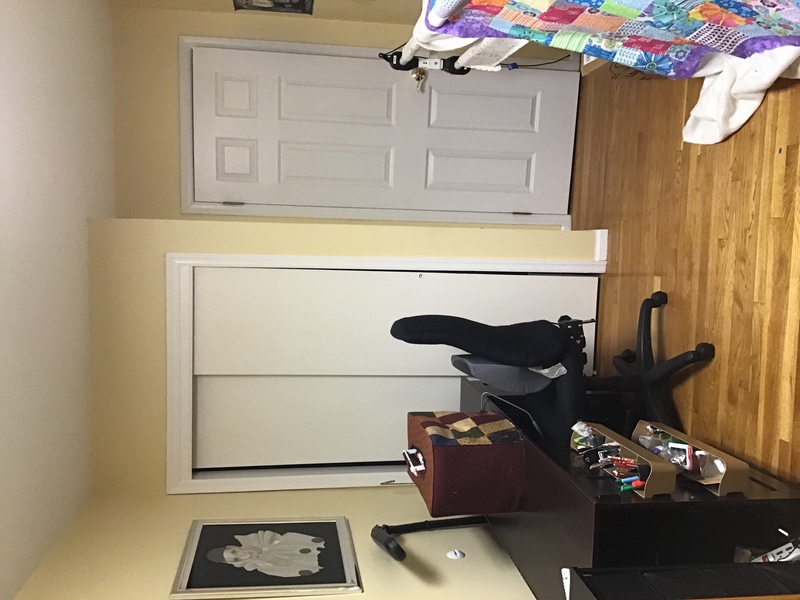 About the only thing I can do is "expand" into another room or cut down the ironing station (it's 24" X 55") so I can push it into the closet. But, as long as I stay the same size and don't get another piece of furniture.........I'm fine. Just can't have another person sewing in there with me! 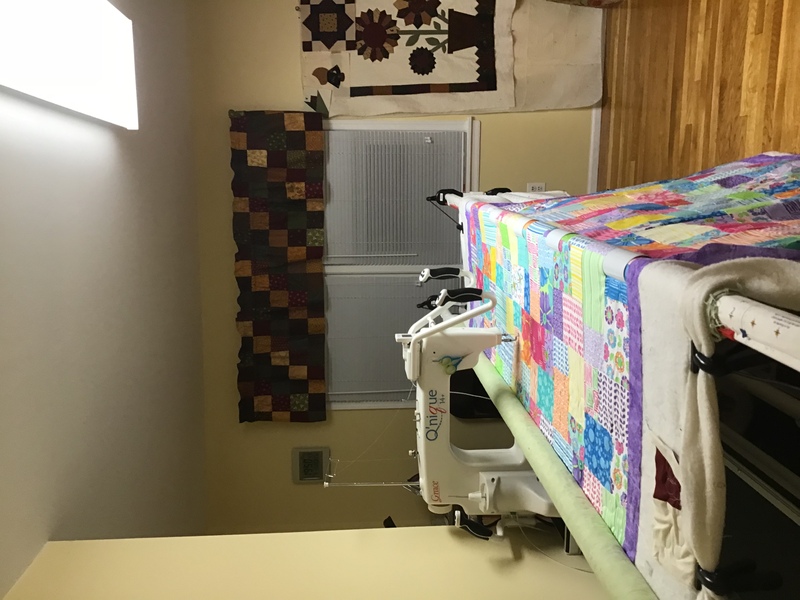 I love all the sewing rooms posted on this thread! They are absolutely lovely. I look forward to having my own room some day. For now, I have a corner that I carved out of our living room. I don't have a large fabric stash. I haven't been doing this for very long and I don't have the storage space in my home for a large stash anyway. As you can see in the photo, my "design wall" (read: flannel sheet) is folded up on my sewing desk. I bought the desk at a yard sale and my husband was kind enough to butcher it to set my machine in last year. It also has "wings" that fold up on either end. I think the total length of the desk ends up at 90" or so. My sewing desk serves as my cutting table for smaller cutting projects. For larger cutting projects, I break out a folding table and a set of bed risers I picked up at the second hand store. Ironing is done on the homemade mat for small projects and the ironing board comes out of the laundry room for more ironing needs. I am actually thinking of making a cover for my folding table to allow me to iron on it. I originally had my desk facing the window but found the sunshine coming in on my work space to be too much at times. This way, I can also glance up at the television if I'm so inclined. I also have a couple sets of plastic drawers for storage under my desk. They hold my odds and ends, scraps and yarn. 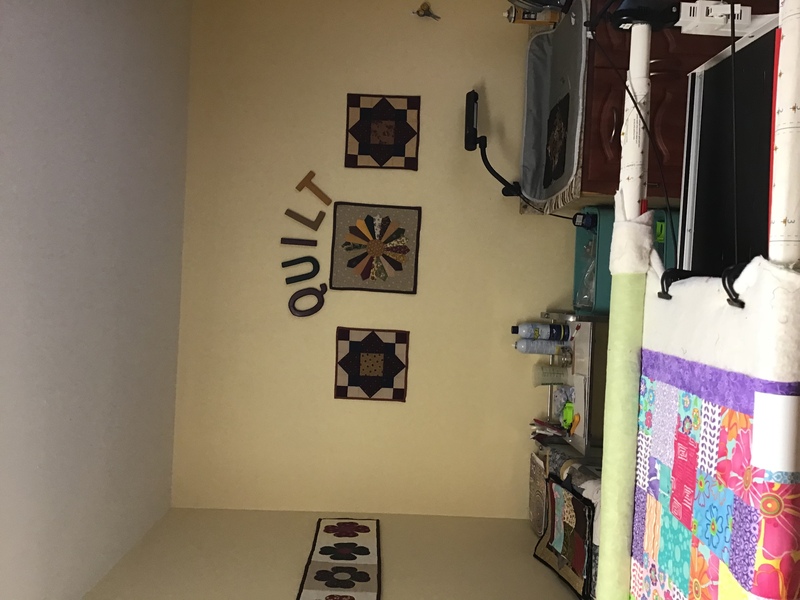 mrsg730 - I just have to say that the quilt on your long arm right now is stunning! 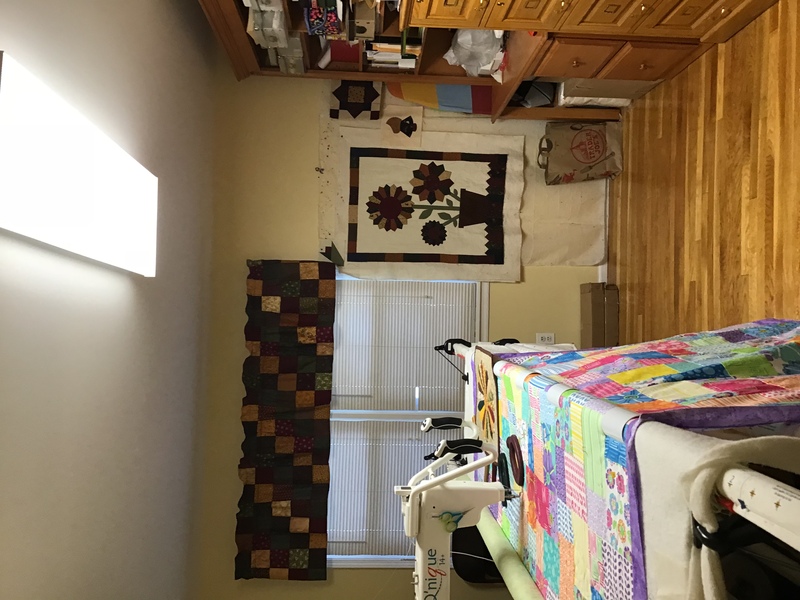 My sewing room is 10'x11'. I purchased the Sauder furniture: Harbor View Craft Armoire and the Harbor View Storage Cabinet, both in an antique white. They came unassembled but we had no trouble with the assembly. I have had these for quite a few years and they are wonderful. Check them out as they help me stay very organized. I have an area/room downstairs that has my sewing machines, current projects, part of my stash and cutting table. I use a rolling table so I can move around it as I desire. It is tall enough and holds a medium large cutting mat. These are the rolling carts they sell for kitchens. Peterswife ——-sure would be nice to see ur pics. I just have a big triangle with a mark in it n clicking on it dies no good. I'm in the early stages of building out a new sewing "room". When I left HS, I chose Engineering over Art School. I'm moving toward retirement, and looking forward to spending more time making things. So I leased a 420 sq.ft. room at Lowell's Western Ave. Studios. The build out will use Lowe's unfinished oak kitchen cabinets for storage, 2 Sauder sewing cabinets and bookcases, and a Joann's cutting table. Oak laminate flooring and a few of the cabinets are new. I may also invest in an old country store display case. Machines are Pfaff Creatives 2140 and Sensation, & HQ 16.
very interesting. So does this mean you will travel to your studio? Before we moved here my best friend and I toyed with rental space so she could watch tab and I could quilt. She is not crafty. That plan never came together. It's about 5 miles from where I live to my studio. And I will still have a multipurpose machine and serger at home. But the bulk of my machines (including the long arm and a mid arm) and stash (enough for five lives) will be at the studio. The studio is in an old mill building with about 300 artists and artisans, is available 24/7, has public access during the day, and sponsors open studios at least one weekend a month. It's cheap space, and will be glorious once I build it out. Two 4' x 8' windows in my studio look out over the canal. While I have no intention of moving when I retire, the reality is that the time may come to downsize. 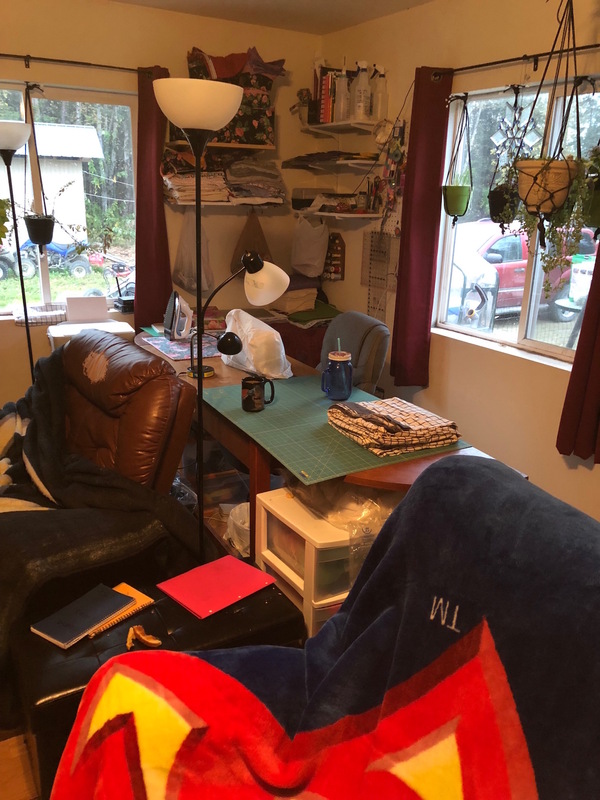 My rental studio and my plots at the community gardens provide insurance that I have the work spaces that are important to me no matter where I live. And the studio is big enough that I can share space, or give classes, if that ends up right.